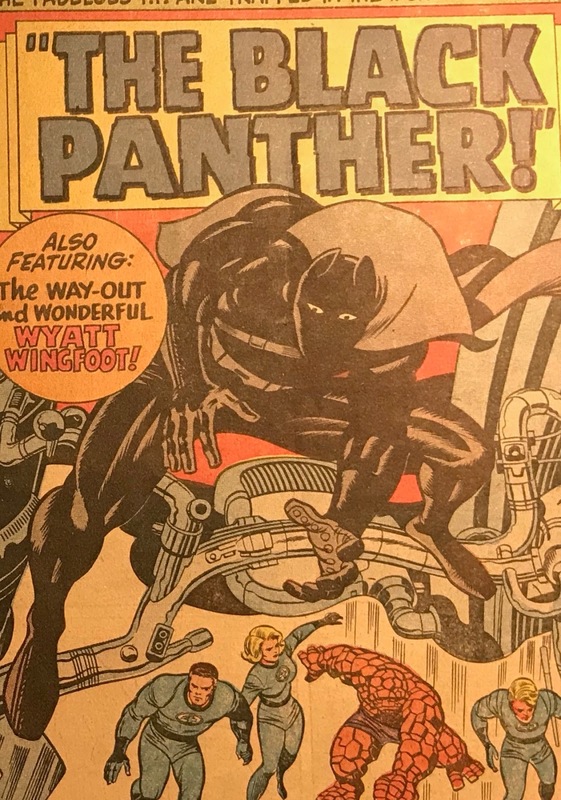 My first experience with Black Panther was probably in the late Summer days of 1976. I know exactly where it was, even if the date is elusive. I was in the back of Buzzy's car while his Mom drove us back home from a trip to a water park in Indiana. I don't recall much about the day except that it seemed like a really long ride up, but a much shorter one back. It was probably the first time I ever noticed that phenomena of travel. The other thing I remember is the comic book my host had brought along. Buzzy had a copy of Jungle Action 23, and it looked pretty cool. 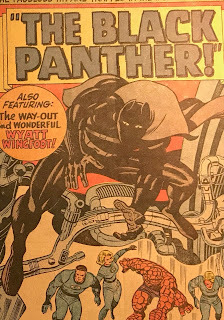 The Black Panther was on the front cover in a bold, prowling stance, ready for action. I don't remember anything about the story but the book had a compelling energy. He lived near a Convenient Food Mart location that often had exotica like this or Silver Surfer reprints, or the Captain America Bicentennial Battles Treasury. Buzzy probably felt the same about my access to Wobbe's Drugs and their selection of books. Black Panther was not the first black hero I knew of. He was the first one I saw leading his own comic though. He wasn't anyone's sidekick or best friend. T'Challa was clearly his own man, operating independently of other Marvel heroes. You wouldn't believe it now, but there was a time that Black Panther was barely a cult favorite. 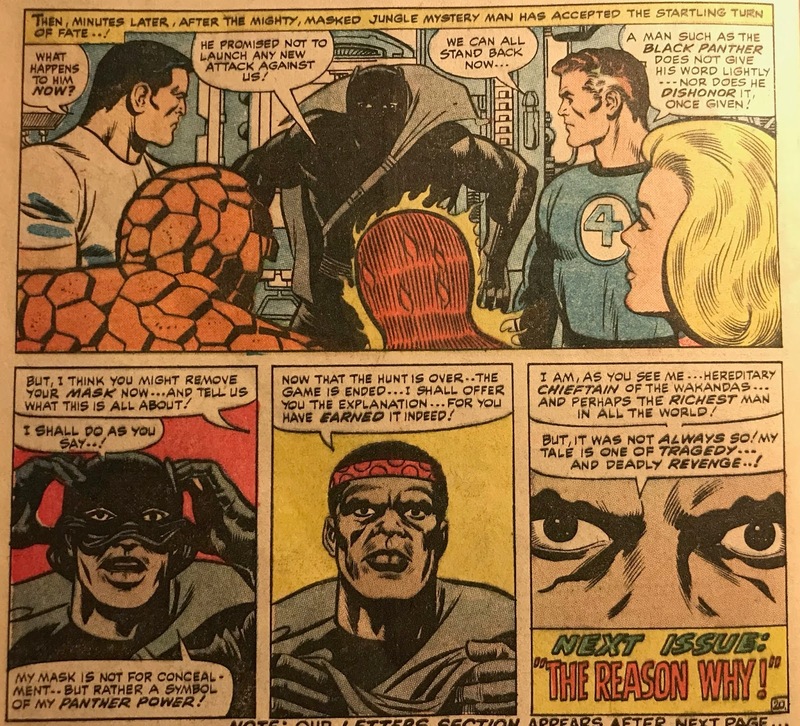 Between Summer of 1976 and 1980, fewer than 20 Black Panther comics were published. From there, he went 8 years before showing up as a lead again. Now the character is everywhere in culture, and globally at that. It's pretty satisfying to see. 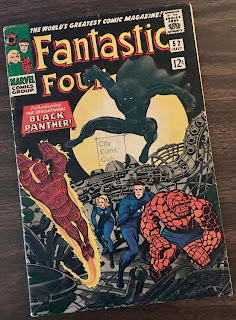 A couple of years ago I decided to collect the first appearances of every black character. I set a few rules, as collecting is a madman's pursuit, and can spiral out of control easily. The first rule was "start with Black Panther." So I did. 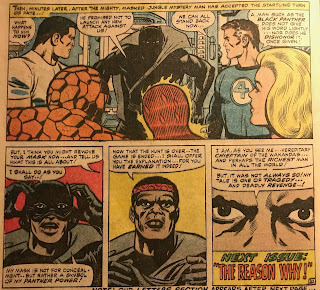 Here's a look at Fantastic Four 52 by Stan Lee and Jack Kirby from 1966.